We are proud to offer you this high quality purple essential oil case for 30 aromatherapy bottles, stylish practical case at a brilliant price.  Purple soft feel wipe clean fabric. Introducing the purple essential oil carrying bag, a very practical and spacious essential oil bottle holdall designed to meet the needs of all your aromatherapy oil storage needs of both the home user and aromatherapist professionals. If you are constantly on the move with your work, or going to collage with all of your oils. With 30 compartments for your essential oils (bottle sizes 5ml, 10ml and 15ml), you'll have plenty of room for your oils. Whether it's smaller size bottles like 5ml, or the standard aromatherapy bottle size of 10ml to the more larger 15ml size, the 30 slot aromatherapy case can hold them all. Complete with a carry handle , you'll find it easy to take your essential oil bag with you. 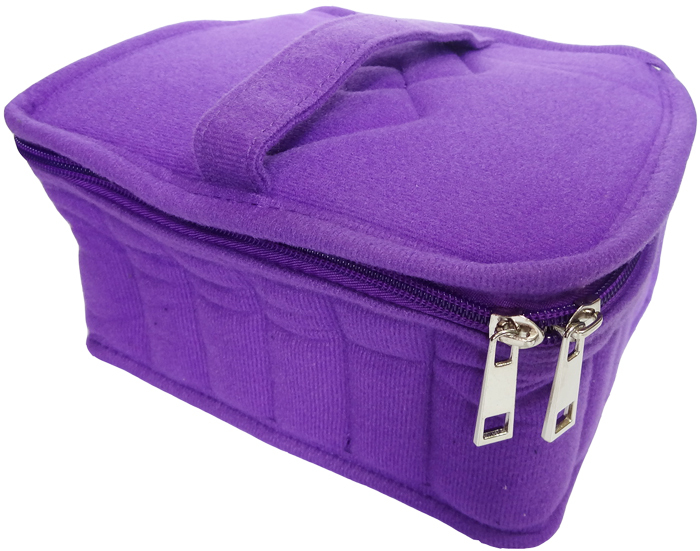 If this purple 30 bottle essential oil bag isnt quite what you are looking for, please feel free to browse the rest of our wooden aromatherapy boxes and cases.